Image of Ceres captured by NASA’s Dawn spacecraft during approach on Feb. 12, 2015. Credits: NASA/JPL-Caltech/UCLA/MPS/DLR/IDA. Won’t you look at that! Here’s a view of Ceres captured by NASA’s Dawn spacecraft on Feb. 12, 2015, from a distance of about 52,000 miles (83,000 km). No longer just a grey sphere with some vague bright spots, actual features can now be resolved – craters, mountains, and scarps that quite literally no one has ever seen before! Fantastic! Images of Ceres captured by NASA’s Dawn spacecraft on Feb. 12, 2015 from 52,000 miles away. Credits: NASA/JPL-Caltech/UCLA/MPS/DLR/IDA. Still on its steady ion-propelled approach, Dawn will enter permanent orbit around the 590-mile-wide Ceres on March 6. Find out how to join or host an “i C Ceres” event on May 9 here. As amazing as it is to see Ceres so clearly for the first time, scientists are already finding lots of features to raise questions about – specifically all of the bright regions dotting its surface, including the large northern one that was spotted in Hubble images over a decade ago. Follow more Dawn mission news here. Where did the “white spot” go…? It’s up there, on the right side of the second picture. Very reflective spot. 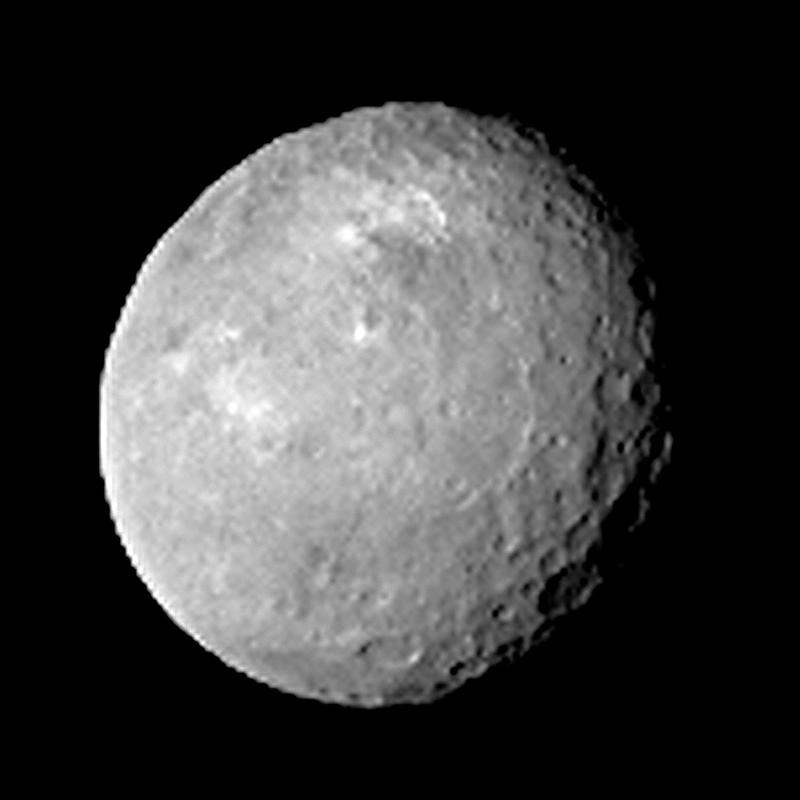 Ceres seems as well cratered as Mercury or the Moon. And this big white spot could be what ? ?